The hotel Cordelia is the place where romantic writers used to meet in the 19th century. In an elegant and relaxing atmosphere of serenity, Countess Cordélia of Greffulhe invites you to discover her 30 non-smoking and air conditioned rooms, all recently renovated. A harmony of shimmering colours combined with some historical eye winks and modern equipment. The courtesy of our staff will make your stay a special moment! 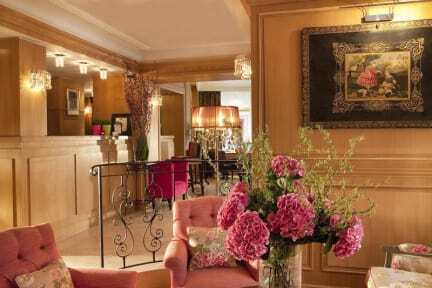 Hotel Cordelia is ideally located in Paris. Hôtel Cordelia Opéra-Madeleine is 350 meters from Saint- Lazare and a 15-minute walk from Concorde and Champs Elysees. Metro Havre – Caumartin is only 300 meters away allowing guests to explore all the famous sites in Paris. All rooms are differently decorated but they stay true to style, each of the 30 rooms (Classic, Comfort and Privilege) have contemporary requirement and charm that inspire relaxation and serenity. Some rooms will surprise you with a flowered window. Cordelia's rooms inspire heaven and are placed in the heart of the world’s business and fashion. They offer guests the assurance of a stay under the sign of comfort. Classic Rooms: A single room, high quality bedding, 160 size bed, 〖a 10m〗^2 private bathroom with a shower. The Classic room combines comfort and modern equipment, ideal for a short stay. Comfort room- Double or Twin: These rooms are equipped with a 160 or a 180 sized bed, or two 90 cm beds, a 14M² private bathroom with shower or bath. All located in front of the hotel, the rooms are quiet and lovely decorated; they lend themselves to both getaways and business travellers. The rooms are located on the upper floors, their balconies give out on an enjoying Parisian view and our guests benefit from bathrobes, slippers and additional toiletries products. These rooms are equipped with a 160 or 180 sized bed, or two 90 cm beds, 14m2 private bathroom with shower or bath. All located in front of the hotel, the rooms are quiet and lovely decorated; they lend themselves to both getaways and business travelers. Please ask for your double or twin bedding type preference. Taxes not included - Local occupancy tax 1.35 euros per person per night.